Nothing could be simpler than learning how to make bacon, the king of all fried meats. How many “vegetarians” have you known who just eat the periodic slab of crisp sautéed hog fat? I rest my case. Bacon is God. 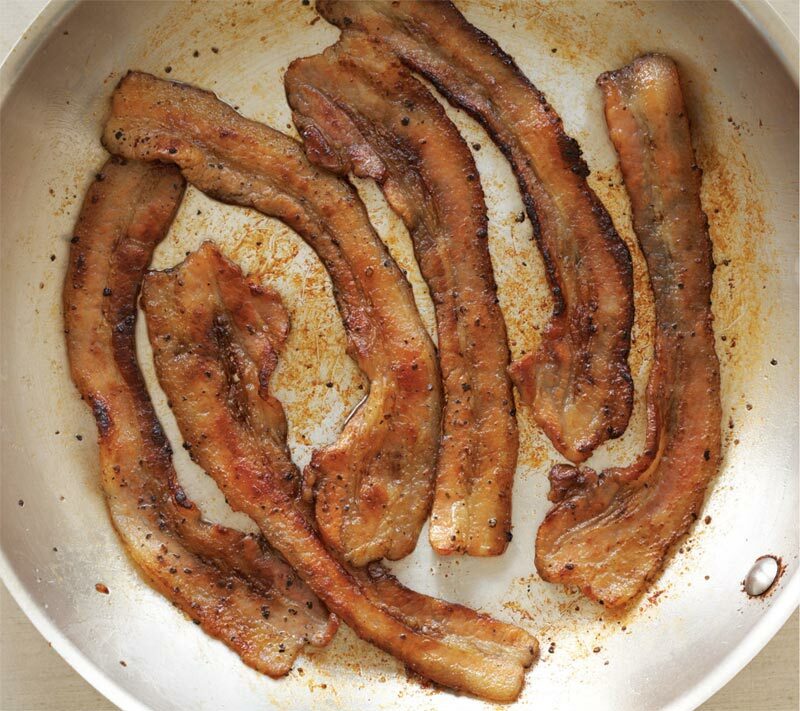 To cure your own bacon, plan and shop for ingredients well in advance. You might need to special-order the pork belly from your local butcher or grocery store. You can order curing salt from online retailers. I recommend purchasing Insta-Cure #1. In this recipe, I offer three ways to smoke the bacon. If you go the liquid smoke route, use only the real stuff: fake liquid smoke has an unappealing chemical taste. If you choose to smoke the meat on the grill, you’ll need some hickory sawdust, which is available in smoking stores or through online retailers. Once the bacon is ready to eat, note that it will be easiest to slice thinly—a must if you like crispy bacon — when it is partially frozen and your knife is very sharp. Have on hand 3 tablespoons of real liquid hickory smoke or 5 cups of hickory sawdust, depending on the method you’ve chosen to smoke the bacon. After 7 days, inspect your bacon. It should be firm to the touch all over, like touching a cooked steak—a sign that it has been cured. If the flesh still feels spongy and soft in spots, massage the meat again with an additional 2 tablespoons salt and check it again after 1 or 2 days. 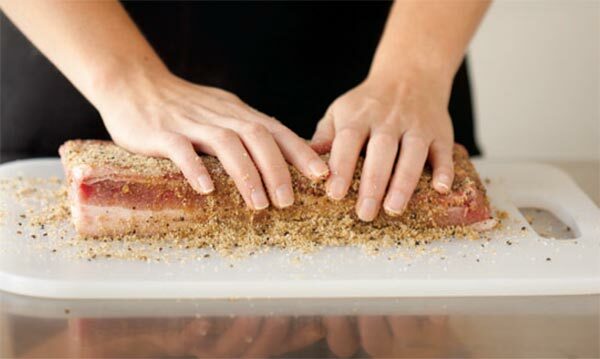 Once the bacon is fully cured, discard the solids, rinse the meat well, and pat it dry. The next step to giving bacon that familiar flavor is the addition of smoke. Fastest: Roasting and Liquid Smoke Preheat the oven to 200°F. Place the belly, fat side up, on a rack over a roasting pan and roast for 2 to 21/2 hours, until the interior temperature of the meat reaches 150°F. Gently brush the liquid smoke over the entirety of the bacon, covering both sides evenly. Slowest: Smoking on the Grill Refer to “How to Smoke,” page 60. Smoke the meat, fat side up, using a 5-cup packet of hickory sawdust, for 3 to 5 hours, until it reaches an internal temperature of 150°F. Best of Both Worlds: Smoking and Roasting This is my preferred methodology, because I love the flavor of the smoke but often lack the patience for a full grill session. Start smoking your meat, and do so as long as you’re able—at least 2 hours is really ideal. Smoke it until you get sick of babysitting the grill and tending to the coals. Finish the meat on a rack over a roasting pan in a 200°F oven until it reaches 150°F inside at its thickest point. Fry a slice of the bacon and taste. If it needs more smoke flavor, brush a thin layer of liquid smoke on both sides of the slab. Bacon can be stored in large slabs, in precut hunks for flavoring beans or other dishes, or in slices, in layers between pieces of parchment paper, and sealed tightly in a freezer storage bag. Refrigerate up to 10 days or keep frozen up to 3 months.